How sad -- the lower photo, I mean. During WWII my mother and several of my uncles and aunts worked at AC building the implements that defeated the Axis powers. At the time my dad was a flight engineer in the Army Air Corp while his wife was building the .50 caliber machine guns that provided armament for the Air Corp planes. Having lived in the Potter School area from '58 until I went into the Army in '67, the AC complex was one of the areas that you passed through several times a day to get to school, downtown, well, to get virtually anywhere that your life took you in those days. Considering its' sprawling size, it was a major part of the neighborhood and well-suited to gumming up local traffic at shift change. Later, my sister and my first wife (...ack!...) worked there making oil filters and cruise control assemblies. And now, reduced to compact piles of rubble and debris, it's gone, what with the rest of the manufacturing world having closed up shop locally and moved away overseas. Truly, I am bummed. One can never go home again. Home no longer exists. Wall Street sold it for short term profits. And your title is quite appropriate, Gordo. During WWII the AC complex was also involved in manufacturing certain components used in the Norden Bombsight. "That's a sin and a goddamned shame". 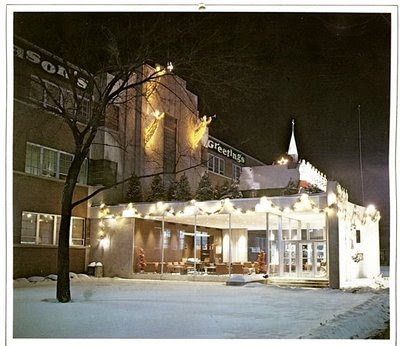 AC was a cornerstone (just as St. Joe's Hospital was) in this area for years. My Grandfather retired in 1968 from AC, and my some of my earliest memories at 3 years of age were looking up at the HUGE AC water tower and saying, "AC...Grandpa..."
I believe we are witnessing the beginning of the end. wow.... I used to work as a tech repairing the ancient mainframe in the basement of the front office. Then a few years later I came back as a contract employee working on a data storage project in the same building. Then it was kinda sad to see the old data center reduced to a server farm of PC's and the old console as a table. I would never call any of the shops beautiful by any stretch. But they stood for something ... when I think of AC, I think of my great aunt Gladys. I never entered the building. It is a goddamn shame. I spent 20 years at AC Spark Plug both as an hourly and as a salary employee. Made the transition from GM employee to EDS employee. 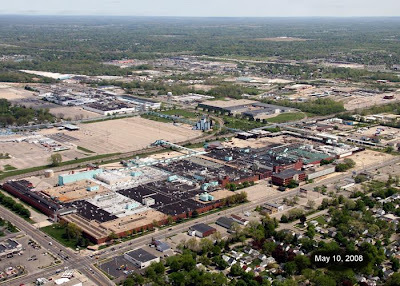 I worked in every GM Plant in Flint except Fisher Coldwater, including AC on Industrial Avenue. When I first witnessed the demolition on the Highway, I was flabbergasted..... I too spent time in the Data Center (the Basement). The last time I went by there, I saw the shell of the Basement. Anybody got any pictures of the Main Office - especially the Data Center? The security guys never let me in with my camera, so I never got any pictures. Understandable, I guess. Here's an AC Sparkplug patch from some time in the 80's, I think. My dad worked at that plant for nearly thirty years (with short stints on Industrial and at the Burton plant), so of all of the demolitions this one hurt the most. I spent a lot of my childhood in the shadow of this place, with my grandparents (my grandpa is still there) at the corner of Meade and Nebraska. Both of them worked there as well, with my grandma (4'11", 95 lbs.) walking there every morning from her house. I've known about the demolition since early May, before the information was released to the media, and I've made a point to drive past (and take a few pictures) very frequently. The fact that there was work going on inside those walls a year ago blows my mind. My brother moved to Ypsi to go to EMU and only comes back occasionally, so a few weeks ago I drove him by there. In his words: "The fact that I can see Walgreen's from Robert T... I could cry." 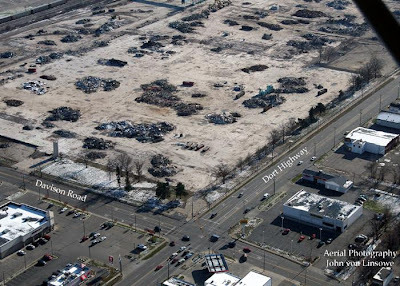 Don Williamson claimed that the demolition would make the property more desirable on the market, but everyone knows it will be a big, vacant concrete lot, just like Buick and Chevy in the Hole. I have been in that plant more times than I can remember, and yes, it is a goddamn shame. I have a AC SPARK PLUG DIVISION Photo book from years ago that was my grand fathers. I'm not sure of the age of the photos they can be seen here. Has anyone seen one of these photo albums before?